Myth: The way a soldier’s horse is portrayed in an equestrian statue indicates how the soldier died. At Sheridan Road and Belmont Avenue, the statue of [General] Sheridan beckons troops to battle. The horse General Sheridan rides is named Winchester… Winchester’s raised leg symbolizes his rider was wounded in battle (the legs of [General] Grant’s horse are on the ground, meaning he was not wounded). This gives a pretty good account of the myth as it is generally stated, but leaving out the third commonly said option of the horse having both front legs in the air, implying the soldier died in battle. Another caveat is that if the rider died of complications from wounds received in battle, but at a later date from the battle, most versions of this myth have it that just one leg should be up as with the people who were wounded but didn’t die of complications from the wound. According to the U.S. Army Center of Military History, no such tradition has ever existed. This is not surprising considering that examples of multiple equestrian statues of the same person tend to be inconsistent in terms of the horse’s legs positioning. But let’s not take the U.S. Army historian’s word for it, let’s look at some examples. One of the oldest known equestrian statues in the United States is the 1853 statue of General Andrew Jackson in Lafayette Park, Washington D.C., which was made in celebration of Jackson’s victory over the British at the Battle of New Orleans. In this statue, the horse has both forelegs in the air. Of course, Jackson did not die in battle but of tuberculosis. The person who cast that sculpture, Clark Mills, was the first sculptor in the United States to cast a horse with a rider where the horse has some of its legs in the air (in this case both)- at this point it was more of a mark of the skill of the artist to have the horse with legs in the air rather than any sort of tradition relating to battle and death. The only place where this equestrian statue “tradition” seems to hold with any sort of consistency is with a few statues of soldiers who fought in the Battle of Gettysburg. (This is thought to be how the myth got started in the first place.) Of the nearly 500 monuments at Gettysburg, there are 6 equestrian statues. Five of the six conform to the myth and the sixth loosely does, but the problem is the statue of General John Sedgwick, who died at the Battle of Spotsylvania Court House- his equestrian statue has all four hooves are on the ground. Even then, it seems odd such a code would be created just for 6 statues of prominent people who fought in the battle of Gettysburg, and even more odd that if the code did exist that they would have broken it in one of the statues. Given there is no record of the sculptors having done this intentionally, and the discrepancy, it’s really not clear that this is what they were going for. It’s possible given the small sample size and that this is the only place we find this somewhat consistent correlation, it just randomly happened to work out that way with the way the sculptors decided to make the statues. So this covers pretty thoroughly the statues in America. What about the equestrian statues across the pond? The Ancient Romans had numerous examples of equestrian statues, but unfortunately nearly all were destroyed or melted down for use in other things. 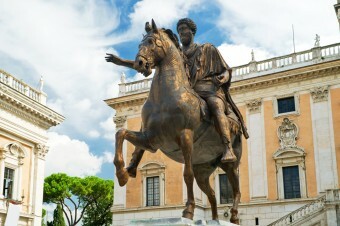 One of the very few surviving equestrian statues from Rome was of Emperor Marcus Aurelius who died in 180 of an illness. His horse in that statue has one foreleg up in the air. There is no record of Marcus Aurelius ever being wounded in battle and as a prominent Roman and eventual Emperor, it’s unlikely he saw much direct, close-up battle time (though was a part of many battles). There is a surviving equestrian statue of Emperor Constantine with the horse having both front legs up. Constantine did not die in battle, rather of natural causes. Fast-forward to more recent times, in Medieval Europe and there really aren’t many equestrian statues, as they were (and are) very expensive to make and require a skilled sculptor. The few examples that exist don’t seem to correlate at all with any sort of horse leg tradition. For one brief, slightly more recent example, we have King Louis XIV who had an equestrian statue at Versailles with both forelegs on the horse in the air. Louis XIV died of gangrene at the age of 77, not in battle. If a statue with a rider and horse is called an “equestrian statue”, you might be wondering what a statue of just a horse is called. That answer is an “equine statue”. A much lesser known statue myth has to do with European knights. The myth goes that if the knight’s statue or tombstone depicts them with their legs or arms crossed, then the knight fought in one of the Crusades. The idea behind this is that crossing the legs or arms represents the cross of Christ, more or less that the soldiers “took up their cross” to go fight in the Crusades. As with the above equestrian statue myth, it simply isn’t true. “Equestrian” comes from the Latin “eques”, meaning “knight”, which in turn derives from “equus”, meaning “horse”. One correction to this article; if you were a successful ancient Roman General you would have to have seen, and be seen, to have plenty of up close battle action. Two of the most famous were renown for fighting on foot directly alongside their troops in the line, Germanicus and Caesar. Even Augustus was witnessed taking the lead as first onto the wall breach in a siege carrying a standard when the first troops fell. If the horse in the statue has all four legs in the air, the horse died in battle. If a statute depicts a general aboard a horse with it’s front legs off the ground , wings spread wide and horn pointing upwards , well than you can safely deduce that your general was a fairy . Sorry couldn’t resist.